January 18, 2013, 12:25 pm -- /EPR NETWORK/ -- Preparing and printing W2 Forms should not be headache for small business owners this 2013 tax season. Developers at Halfpricesoft.com have released the new ezW2 software which can save time and money in tax reporting. Which will lead to increased productivity and lower costs in preparing W2 and 1099 tax forms. The ease and simplicity of this software takes the guesswork out of preparing, printing and e-filing forms W2, W3, 1099-misc and 1096 for users with little to no accounting background. 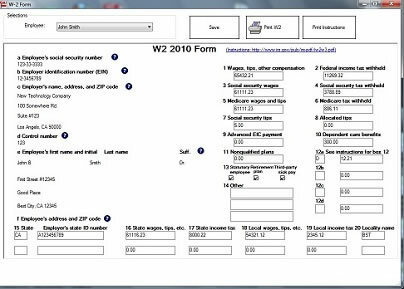 New users can download this W2 and 1099 application online at http://www.halfpricesoft.com/w2-software-free-download.asp and sample the software without charge or obligation, allowing them to thoroughly test drive ezW2 before purchasing. The trial version will print the watermarks on forms. Users can purchase the license key to remove it. - It also prints 1099 MISC recipient copies on white paper. - It helps users go green by generating w2 and 1099 PDF forms for recipients.